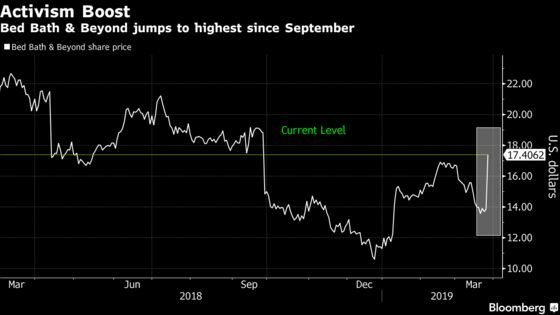 (Bloomberg) -- Bed Bath & Beyond Inc. soared as much as 30 percent -- the most intraday in 19 years -- on news that activist investors plan to challenge the home-goods retailer’s directors in a proxy fight. The company responded Tuesday by saying the investors have ignored its requests for feedback and only appear interested in gaining ammunition for an activist battle. Three activist funds are launching a campaign to replace the entire 12-person board amid concerns that the retailer is not responding well to the rise of e-commerce, according to people familiar with the matter. The trio -- Legion Partners Asset Management LLC, Macellum Advisors and Ancora Advisors LLC -- control about a 5 percent stake in the Union, New Jersey-based retailer and are seeking to replace Chief Executive Officer Steven Temares, according to the people, who asked not to be identified discussing a private matter. Bed Bath & Beyond confirmed Tuesday that it had met with Legion and Macellum in recent weeks and asked “on several occasions” for “suggestions and ideas for improving the company’s business but they did not provide any.” It said there hasn’t been any contact with Ancora. Bed Bath & Beyond shares climbed to as high as $18.09 on Tuesday. They had sunk 34 percent over the past year on skepticism that the company will be able to hit its targets. Bed Bath & Beyond has faced many of the same challenges of other traditional retailers, including a costly battle to ward off Amazon.com Inc. It has spent heavily to revamp both its brick-and-mortar stores and online presence as it tries to bring to an end seven straight quarters of same-store sales declines. Representatives for the three funds didn’t respond to requests for comment. The Wall Street Journal had earlier reported on the activist challenge. Bed Bath & Beyond said that it has hired Goldman Sachs as a financial adviser and Wachtell, Lipton, Rosen & Katz as legal counsel.